Newport Shipyard is proud to announce that Helly Hansen Newport, the oldest Helly Hansen licensed store in North America, owned by Jay Lasky, has signed on for the fourth straight year as the presenting partner of the 2019 Newport Charter Yacht Show. Held each June at Newport Shipyard, the Newport Charter Yacht Show will feature an impressive lineup of power yachts and sailing vessels available for private charter. 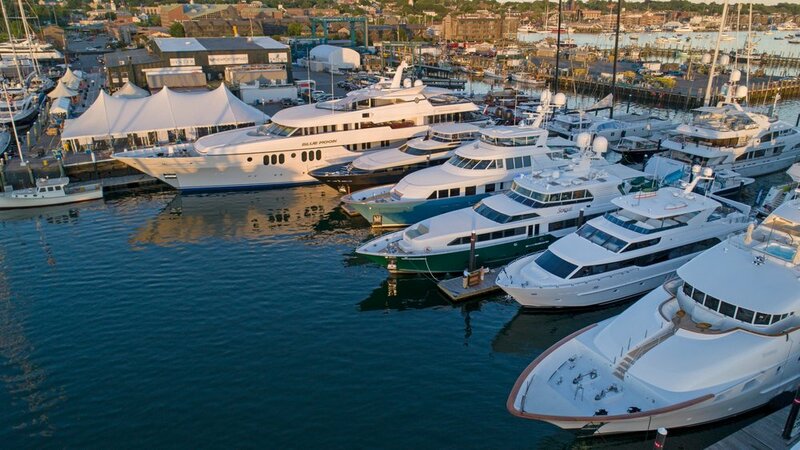 The 2019 show, slated to be held June 17-20, will offer yacht charter brokers and industry professionals from around the world the opportunity to preview participating charter yachts headed to New England for the season. “Helly Hansen has been a great partner to us for the past three years and we think it’s a natural fit to match a premium marine lifestyle clothing brand with the Newport Charter Yacht Show participants and industry attendees,” said Eli Dana, Newport Shipyard’s general manager. “We choose to outfit our entire team here at the Shipyard with Helly Hansen gear and apparel because the technical & durable properties in their workwear line are ideal for our employees who work outside year-round; and the more lifestyle pieces keep our office and dock staff looking professional, warm, and dry,” said Dana. “We see more and more yacht owners also investing in Helly Hansen gear for their crewmembers which is why partnering with them for the Charter Show is a win-win for everyone,” Dana said. “It’s no secret the weather in New England isn’t always perfect which is why Helly Hansen gear is ideal for power boaters, sailors and anyone working on and around boats,” said Jay Lasky who has owned Helly Hansen Newport since 1992. “Sponsoring events like the Newport Charter Yacht Show creates great synergy for us in the yachting community locally. The Helly Hansen brand and reputation have become well known within the yachting crowd and we hope to continue building our brand and reaching new customers through the Charter Show and Newport Shipyard’s reach,” Lasky said. Newport Shipyard is proud to announce that in addition to Helly Hansen Newport, returning sponsors (to date) also include: Sea Hawk Paints, Alexseal Yacht Coatings, KVH Industries, Bank RI, Bridge Liquors, KEEL Vodka, and our hotel partner, the Newport Marriott. “2019 is shaping up to be another phenomenal year in Newport with many great events planned,” continued Dana. “We are very excited about the 2019 Transatlantic Race, which starts from Newport shortly after the Charter Show on Tuesday, June 25. The 12 Metre World Championship, NYYC 175th Anniversary Regatta and Candy Store Cup will all take place in July, and the Newport Yacht Rendezvous to support the Boys & Girls Club of Newport County will be held once again at the Shipyard on Friday, August 9th. The fall also looks to be busy with the Newport International Boat Show and Newport Brokerage Shows happening September 12-15 and we are very excited about the first-ever Audrain’s Newport Concours Motor Week October 3-6. These events will will certainly attract more people and more yachts to Newport which is fantastic,” Dana added. Twenty Yachts Registered to Date for Newport Charter Yacht Show Presented by Helly Hansen Newport!